Kournikova tops car wash poll | What Car? 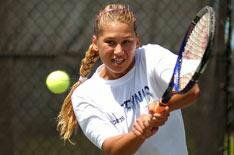 Former tennis star Anna Kournikova has been voted the celebrity that most men would like to see wash their car. The survey, conducted by car supermarket Motorpoint, asked which celebrity men and women would most like to see on their driveway with a bucket and sponge cleaning their vehicle. Kournikova was closely followed by singer Christina Aguilera (23%) who, ironically, released a single called Car Wash a few years ago - and actress Scarlet Johansson (16%). In the same study, actor Johnny Depp topped the list among female voters, taking 25% of the vote, beating fellow actors George Clooney (22%) and Ewan McGregor (12%).